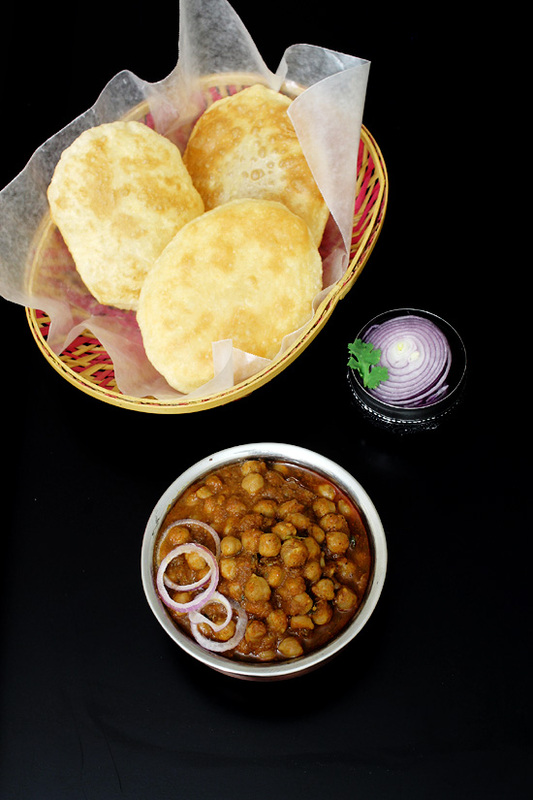 Chole Recipe – a delicious and protein pack chana curry recipe from Punjab. Chickpeas are cooked with onion-tomato gravy. It is also called Punjabi chana masala. Chole has other names like kabuli chana or safed chana. Chole is called chickpeas in English. Chole masala recipe is also known as Punjabi chana masala. Today I am sharing very easy to make chole recipe. It is made in pressure cooker only. Instant pot chana masala: The popular chole recipe made in electric pressure cooker. Jain punjabi chole – It is no onion no garlic recipe. Palak chole – Chana are simmered in spinach gravy. Aloo chole – boiled chana and potato cubes are simmered in Punjabi gravy. 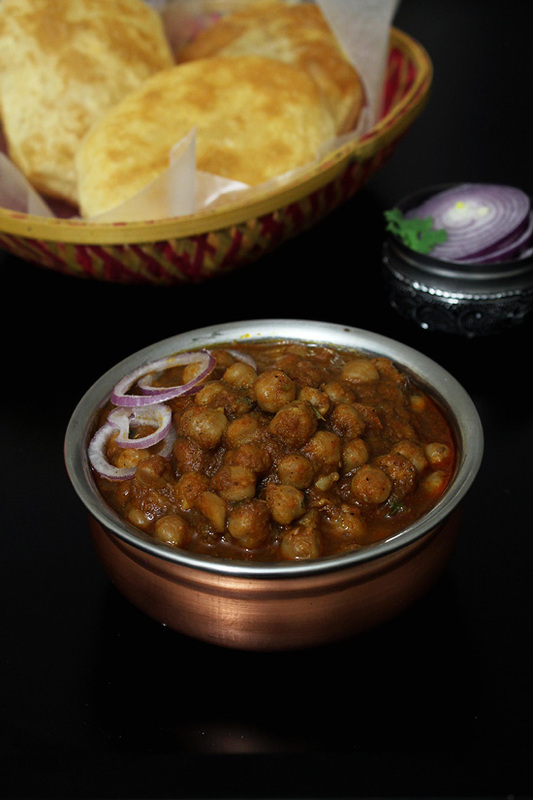 Amritsari chole – boiled white chickpeas are slowly simmered with onion, tomato, and spices. Chana Paneer – boiled chickpeas and paneer cubes in creamy Punjabi gravy. Onion-Tomato – The paste is made from onion, tomato along with ginger, garlic, and green chilies. This paste is sauteed which makes the thick gravy. Anardana powder and Amchur powder: This gives a nice tang to the dish just like the restaurant style chana masala. In absence of it, use lemon juice. How long soak chole before cooking? Chole needs at least 8 hours or overnight soaking before cooking. But what if you forget to plan ahead of time? I have shared a quick soaking method below. But I highly recommend overnight soaking. Pre-soaking the chole will reduce the cooking time. This reduced cooking time can mean less loss of water-soluble nutrients due to less time of exposure to heat and water. This is the reason, I prefer overnight soaking over quick soaking. Quick Soaking method: Take beans and plenty of water in a pan. Bring the water to a rolling boil. Let it boil for 2-3 minutes. Then turn off the stove and cover tightly with lid. Let it sit for 1 hour. Voila, after 1 hour your beans are at the same stage where you have after overnight soaking. Yes, you can use canned chickpeas. You will need 1 ½ cans. Reduce the pressure cooking time to 10 minutes and reduce the water to 1 cup. I do not prefer to use canned products and processed food. So I would not recommend. But the choice is yours. 1) Wash dry chana under running cold water till water runs clear. 2) Soak them in enough water for 8 hours or overnight. After soaking they will double up in size. drain the soaking water. 3) First, we will make dry spice powder. 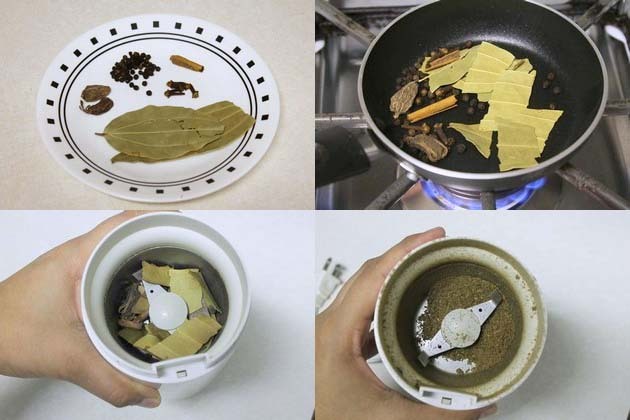 Take bay leaves, black cardamom, cloves, peppers and cinnamon stick in a small pan. 4) Dry roast them on low-medium heat for 2 minutes. You will get a nice aroma of spices. 5) Remove it to a plate and let it cool completely. Once cooled, take into the grinder. It can be a coffee grinder or spice grinder. 6) Make fine powder out of it. Keep it aside. 7) Now chop onion, tomato, ginger, garlic and green chili. 8) Make a smooth paste in grinder or blender. You do not have to remove it to a bowl. I did it for photo purpose. 9) Heat the oil in a pan on medium heat. Once hot add cumin seeds. Let them sizzle a bit. 10) Then add prepared onion-tomato puree. Sprinkle some salt. 11) Let it cook. It will splutter a lot. you can partially cover it. It avoids some mess around the stove. 12) Cook till oil starts to leave and moisture is evaporated. 13) Then add red chili powder, turmeric powder, coriander powder, anardana powder and prepared spice powder. 14) Mix well and cook till oil starts to ooze out. 17) Add 2 ¼ cups of water. Cover the pressure cooker with lid. Put the weight on. Let it cook for 20-25 minutes on medium heat. During cooking time, it will keep whistling. 18) Then turn off the stove, let the pressure go down by itself. Open the lid. Oil will be floating on top. 19) Stir with a spatula. Check the chana. it should be cooked and soft, not mushy. Taste test the gravy. adjust the salt or chili powder as per your liking. Also, check the gravy consistency. If gravy is thin and watery, then let it simmer for a few minutes. If it gravy is too thick. add some more water and simmer for 2-3 minutes. Mine was perfect for me. So I have not added any extra water. 20) Add amchur powder and mix. 21) Lastly add chopped cilantro. 22) Mix well. Punjabi chole is ready to serve. What to serve with Punjabi chole? Serve this chana masala with Bhatura, puri or paratha. Also, have some sliced onions or onion rings w/ lemon wedges on the side. Many times I also serve mango pickle and chaas or salted lassi on the side to complete a meal. In my capsicum curry recipe, many readers has issue that their gravy becomes bitter. It happens sometimes when you are grinding the raw onions. How to avoid that? Remove the stem and bottom root of the onion completely. If a single pieces of root is present. The gravy will be bitter. I had a bad experience. and I have thrown in the garbage the whole pot of curry. a lesson learned. Wash and soak the chana in water for 8 hours of overnight. Then drain the soaking water. To make fresh spice powder, dry roast all the whole spices in a small pan on medium low heat for 2 minutes. Once cooled completely, make fine powder using spice grinder. take onion, tomato, ginger, garlic and green chili into grinder jar and make smooth paste. Keep it aside. Heat the oil in a pan on medium heat and add cumin seeds. Once they sizzle add prepared onion-tomato puree along with little salt and cook till it becomes thick paste and leaves the sides of the pan. Add remaining salt, red chili powder, turmeric powder, coriander powder, anardana powder and prepared spice powder. Mix well and cook till oil starts to ooze out. Add soaked chickpeas and water, mix. Cover the pressure cooker with lid. Put the weight on. Let it cook for 20-25 minutes on medium heat. Once pressure releases naturally, open the lid. Check the gravy consistency. If gravy is thin and watery, then let it simmer for few minutes. If it gravy is too thick. add some more water and simmer for 2-3 minutes. Lastly garnish with chopped cilantro. Smells and tastes delicious. 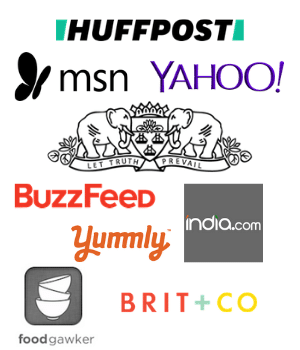 For any recipe that I make these days, “recipe name + spiceupthecurry” has become my googling convention. It’s really delicious, the fresh aromatic spread the house and admired everyone. It’s very spicy veg recipe. Ur receipes is so easy n also things are easily availble in any home.. Thank you very much for your detailed, enticing (great photos), and easy recipe. This is my all time fave chole recipe! I tried ur recipe n it taste awsum.thanks a lot.